Hello bakers! 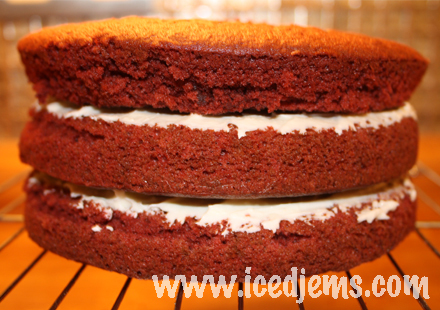 Today is the full recipe and tutorial for my most popular cake – Red Velvet. 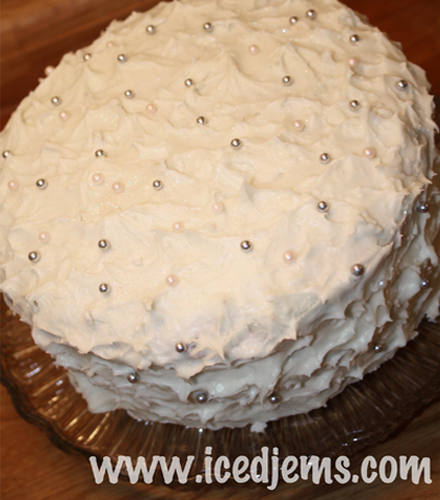 This cake is so popular because of its gentle not too sweet taste and beautiful cream cheese icing…mmm…. The reason this recipe is done “the UK way” is that a substitute is made for buttermilk, as this isn’t readily available in the UK – or when it is, it’s overpriced! The first thing to do is to make the buttermilk! This is done by adding the White Wine Vinegar to the milk, then simply leave at room temperature whilst you continue mixing the other ingredients. With the buttermilk done, set your oven to 170oc / 325oF / Gas Mark 3. To begin the cake, pop the sugar and butter in a bowl and beat until it looks like the last picture above. Simply mix the Red Food colouring, cocoa powder and vanilla extract in a separate bowl until you have a paste like the one above. Then add the red paste to your other mixture and mix well. Now you will need to add your buttermilk to the mixture and mix again. Add the flour and another mix – keep going until you have a very smooth texture. The mad scientist in you will love this next part – add the salt, bicarbonate of soda and white wine vinegar to the mixture and it will fizz like in the picture above. Now give the mixture one final really good mix! 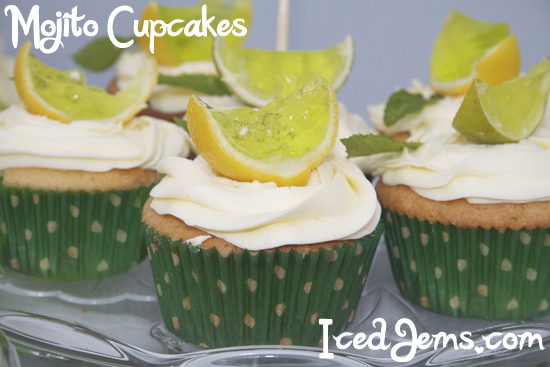 Pour your cake mix into your tins or cupcake liners if making cupcakes (you will probably only need half this mix for cupcakes) and pop into the oven for about 25/35 mins. You should get a nice deep red colour like the one above. Allow your cakes to cool and make your frosting, this is the best frosting in the world by the way – just thought I’d let you know! 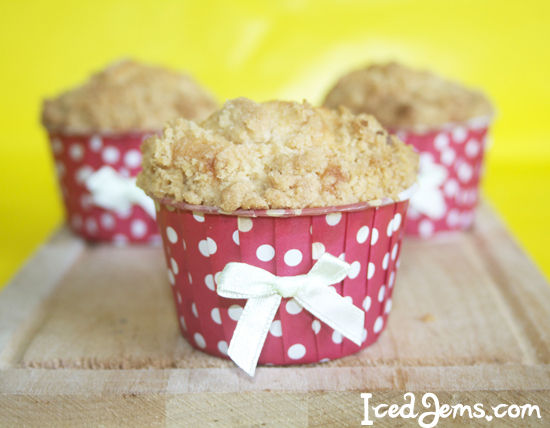 Mix the butter and cream cheese first, then add in the icing sugar to get a consistency like the one shown above! 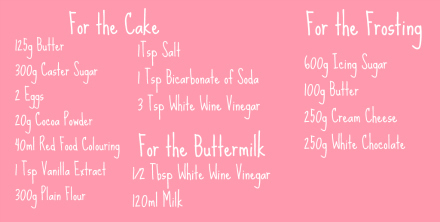 Spread the mixture in between your cake layers. As you can see I didn’t use too much, as the cake tastes so great I didn’t want to overpower the flavour! Now for a “crumb coat” to stop the crumbs getting mixed in with your icing and ruining the look of the cake. I used white chocolate, simply melt it and pour over the top and down the sides of the cake! Once dry, add the rest of your cream cheese icing, I used the back of a spoon to create a peak effect, just place the spoon on the cake and lift gently to create peaks. I also added a few silver and pink dragees for effect, but you could add anything to make it pretty! 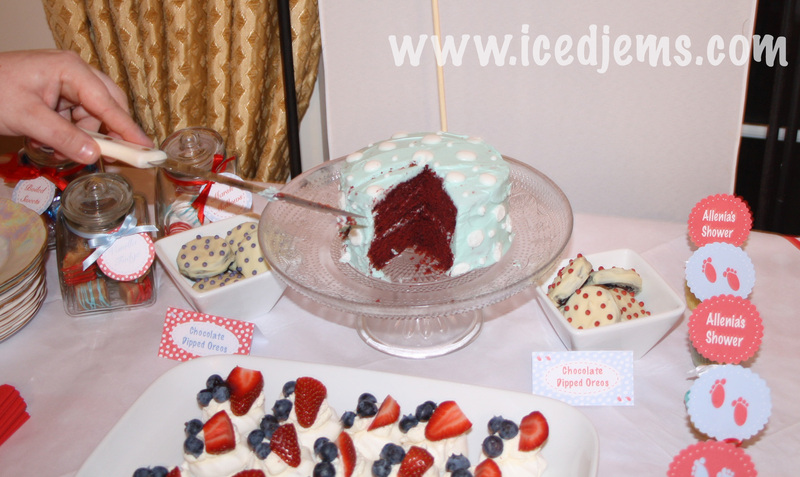 Heres another one I made for a Baby Shower Dessert Table I did, you get a great reaction when people cut into the cake to find the deep red centre! 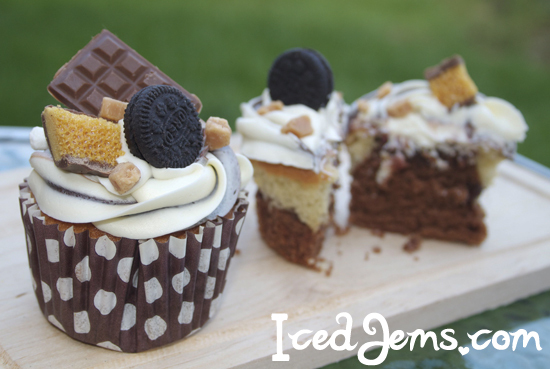 I hope you have fun baking this, leave a picture on our Facebook Group if you give it a go! Thank you so much. Made the cake and it was a hit! Hi I was just wondering what size cake tin you used? Can you please let me know which make of cocoa you used as i have tried to make red velvet cakes on numerous occasions, even using a whole bottle of red food colouring liquid and the cake still comes out chocolate rather than red. This recipe looks amazing – I actually bought buttermilk (I’m in the UK) before I came across your recipe but the rest of it looks great and so useful to have UK measurements. How much buttermilk should I use in the recipe (instead of the milk substitute?) I figure since I have it I may as well use it! I suppose the only difference is that I have Gel paste and not liquid colour, would that make such a difference? In this recipe, is baking soda not needed?